Tracing the developments from Modern Japanese, back to Old Japanese of the eighth century, and to Classical Japanese of the tenth to twelfth centuries, this book considers the linguistic innovations in Japan, and the Japanese language. The introductory chapter describes the place of language and ideas about language in the cultural history of Japan. The following chapters are organised around specific linguistics topics including phonology, indexicality (so-called polite language), predate structures, topic, focus and case, and sentence structures. The grammatical structures are explained in context mostly using authentic examples, and a glossary of linguistics terms has been included to help students who may be new to the field of linguistics. 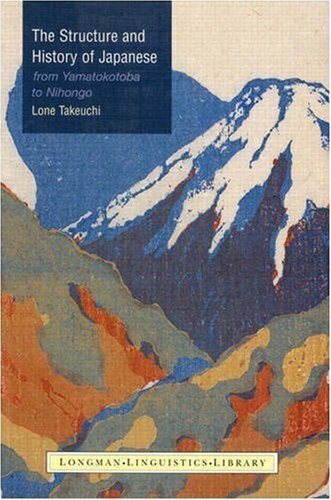 Lone Tackeuchi is a former lecturer in Japanese at the School of Oriental and African Studies, University of London (1983-1996). Her former publications include A Study of Tense and Aspect of Classical Japanese (1987). Japanese makes its first appearance in writing in the middle of the first millennium. Ever since then its grammar has developed comparatively undisturbed, despite the borrowing of large numbers of Chinese and, more recently, English loanwords, and the influence at various times of Chinese, Indian and contemporary western ideas about language and linguistics. Adopting an approach that will prove particularly useful to students, the central chapters of The Structure and History of Japanese examine the phonology, grammar and use of the modern language, but present the data in combination with a section-by-section discussion of the relevant internal developments in the history of the language. Key points are illustrated with extracts taken from ancient and contemporary texts. The external historical and cultural context is provided by an introductory chapter, which presents essential background information, while the final chapter draws together evidence from dialectology, history and archaeology to present an overall picture of the evolution of Japanese throughout the region in which the language is used. There is also a glossary of technical terms and a full, up-to-date bibliography incorporating both Japanese and western scholarship. This book will be particularly valuable for all students of the Japanese language and its cultural background, whether at undergraduate or graduate level, and will also be useful for students of general and historical linguistics needing access to an up-to-date account of this fascinating language and its evolution.